Swati’s gold lehenga by Sabyasachi with a maroon statement border that has heavy zardozi embroidery. Paired with matching diamond-gold jewellery. 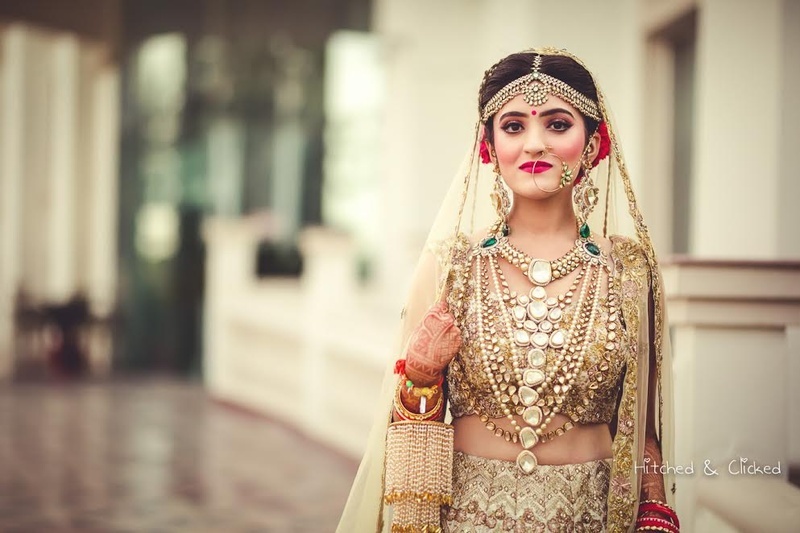 Apsara's bespoke ivory and gold tulle lehenga by Rimple & Harpreet Narula. Accessorized with stunning polki-emerald jewellery. Mugdha’s glittering gold bridal lehenga paired with a pastel pink dupatta. She styled her look with a choker-style polki neckpiece along with matching earrings and a maang-tikka. Khushi’s sparkling gold lehenga with an embellished belt, complimented by emerald earrings. Gayatri’s monotone gold Sabyasachi lehenga with all-over glittering details and a sheer dupatta. She accessorized with a stylised maang-tikka and earrings. Priyanka’s pink and gold anarkali! Her bridal outfit is more pink and less gold but just as glittering and gorgeous.